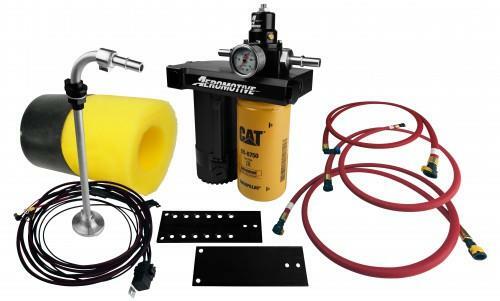 The Aeromotive diesel lift pump was developed to solve some key issues in the diesel lift pump market, most notably the ¼ tank issue, the pressure control issue, and motor shaft seal failures. Aeromotive opted for a flow-thru design to solve the shaft seal failure, which means there is no shaft seal to fail or leak. Specific to the Duramax platform is a fail safe valve. In the event of failure or a no-run condition, the valve will open and allow fuel to bypass the pump. This allows the vehicle to continue to run and get you to your destination, eliminating tow bills. With a brushless motor design, Aeromotive has increased the performance and longevity you would expect from a diesel lift pump. A single filter model simplifies the design and reduces maintenance cost. Our diesel pump includes the Caterpillar 1R-0750 2-micron filter to catch the smallest particulates. With a standard 1-14 filter head thread, the end user can use their filter of choice.